Toxic Controversy: Why is Mercury Still Used in Vaccines? One of the biggest controversies raging among anti-vaccine supporters and those who still believe in being vaccinated is over the use of thimerosal. The discussion is often heated, and emotional. Some have even claimed that the CDC is hiding information linking thimerosal use to conditions like autism, while others try to debunk the claim. The mercury-based preservative is indeed still in many vaccines, but is it safe? They go on to say that due to concerns over neurotoxicity, thimerosal has been removed ‘or reduced to trace amounts’ in all vaccines routinely used on children 6 and younger, with the exception of the Influenza A vaccine (see Table 1). The FDA also admits that vaccines which still contain thimerosal ‘contain only 1 microgram or less of mercury per dose’. Mercury is a heavy metal poison. You can get mercury poisoning from many things besides vaccines – eating sushi, having mercury amalgams in your teeth, or living near a coal mine or other industrial site that pollutes the environment with mercury. You can also get mercury poisoning from vaccines. If vaccine supporters really want us to believe vaccines are safe – why do they still contain a substance that can cause a laundry list of health problems? Nano or Colloidal Silver will do the same thing that mercury is intended to do in vaccines, and that is to protect the vaccine from spoilage. I am not advocating vaccines mind you, I am just stating a fact. The difference with silver is that it will help attack bad bugs, which is the intention of what vaccines are suppose to do in the first place. All these vaccines manufacturers know this. So does the FDA and the CDC. A CDC whistle blower has already stated that the CDC has been covering up for 10 years that thimerosal is linked to conditions like autism. Let’s see; Mercury and Lead, Fluoride, are toxic except in babies, children, and our body. What is the reasoning behind this deaf, dumb, and blind attitude towards our health? Why does the government not do its job is it paid to do? 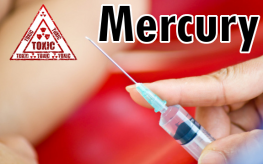 Why is Mercury Still Used in Vaccines? you’d like to tell your grand kids how you helped Mankind win the banksters’ War On Humanity and triggered our prophesied thousand years of peace, justice, truth and prosperity for Posterity…. all from your easy chair in your spare time, then sign the Real Democracy Petition to End Political Corruption at https://secure.avaaz.org/en/petition/Humanity_Start_real_democracy . This will work, because observation is manifestation. For the first time in history, We’ll be able to observe our true will which will manifest it. Our unity is their worst nightmare, so it should be our top priority. [ Smiles ] I think that the average child of school-age is aware of the fact that mercury is a highly poisonous substance. I would say that they were deliberately trying to kill us off. [ Smiles ] I highly suspect that is the case.